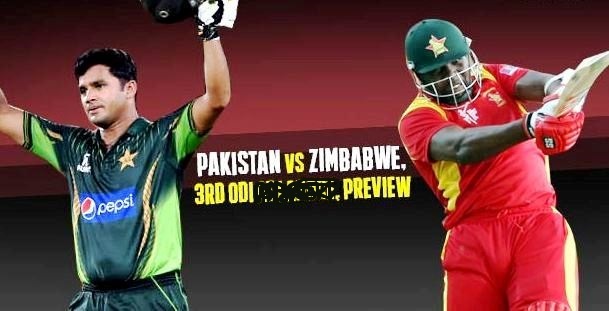 This is the third ODI of five-match series played between Zim vs Pak,. PAK already won the first match. ZIM is a weak team as compared to PAK. Kyle Jarvis & star batsman Solomon Mire has been ruled out due to injuries. Malcolm Waller has withdrawn from the Zimbabwe series citing labor-practice laws. ZIM are without their five best players in the format; Brendan Taylor, Sikandar Raza, Graeme Cremer, Sean Williams and Craig Ervine due to unpaid salaries issues. Without those players, ZIM is looking an weak and inexperienced team. Zimbabwe has called up three uncapped players to the ODI squad, including former Under-19 captain Liam Roche. The other two are wicketkeeper Ryan Murray and 23-year-old batsman Tinashe Kamunhukamwe. Probably Brian Chari & Chamu Chibhabha will open for ZIM. Both are not in good form. Zim can try Tinashe Kamunhukamwe. PAK is a very good team in ODIs. They haven't played many ODIs in this year. They won their last match so probably they will play with the same 11. Pakistan's openers are fearless, the middle order ruthless, the pace bowlers excellent and the spinners canny. But always remember that Pakistan is the most unpredictable team. They can win any match with a huge margin or they can lose with a big margin too. Probably Fakhar Zaman & Imam-ul-Haq will open for PAK. This match will be played at Queens Sports Club, Bulawayo. The pitch will help batsmen. There is some help for bowlers also. Fantasy Tips -Take top order batters of PAK and more bowlers from PAK. X-Factor - Shoaib Malik is a very good batsman and he can bowl off-spin. He is in very good form.